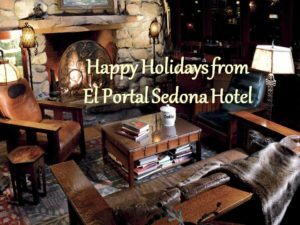 Have a Sedona Mountain Christmas with us at El Portal Sedona Hotel. With all the holiday festivities in the area, the memories made will be treasured forever. At El Portal, we offer you personalized concierge services, we want to make sure you get the most out of your Sedona Mountain Christmas. We love to help our guests plan their time in Sedona! There are special events and seasonal attractions all throughout the holidays – some that last the night, some that last the week, some that last for longer than a month. However, it isn’t just about what is happening, it’s about reconnecting with family, nature, meeting new people, trying new things, eating different cuisine, admiring the local artists and their art. Sedona is a beautiful place to spend quality time with family. 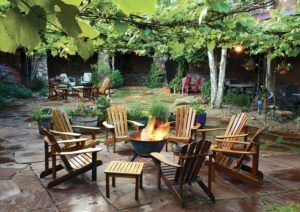 Even if it’s just sitting around the fire pit in the afternoon or evening, visiting, telling stories…you might even make new friendships with other guests..it’s quite amazing our fire pit! Hang out in the great room after a delicious breakfast…you never know what you can learn about loved ones over a good cup of coffee or hot cocoa. Get back to nature. Sedona has world-class hiking and walking trails, suitable for everyone in the family. The landscapes and vistas change with the sun…bring your camera for the wonderful photo opportunities. Red Rock State Park offers a variety of guided hikes; moonlight to birding, fun for the whole family! This is another opportunity to relate with family on a totally different level. And it is an excellent exercise to burn off those extra calories you’ve been enjoying! Speaking of extra calories, not only do we have a delectable breakfast at the hotel, but the “cuisine scene” here in Sedona is fantastic. There are family friendly restaurants, pet-friendly restaurants, fusion cuisine, fine dining, Mexican cuisine. Some are just down the lane from us in Tlaquepaque Arts & Crafts Village. There are day trips to be taken. Sedona is less than two hours from the Grand Canyon, you can take a trip there and make back to the hotel in time for happy hour. Jerome is a unique town, with a haunted restaurant, lots of art, and all set in switchbacks! Historic Old Town Cottonwood is another worthwhile trip; known for its Main Street full of delightful stores to meander through, wineries, and great restaurants, not to mention some fine entertainment. 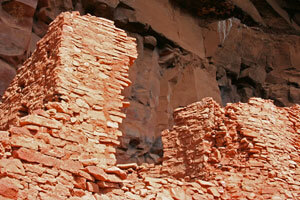 Additional family day trips are the Palatki Ruins and Honaki Indian Ruins, and Montezuma Well & Montezuma Castle. Make a Sedona Mountain Christmas a new tradition in your family. Stay at our boutique hotel located in the heart of Sedona. This is where your trip to Sedona begins and ends. El Portal has received AAA’s Four Diamond Award Rating. We assist guests in planning day trips, jeep tours, hikes, and dinner reservations. We will arrange helicopter rides, hot air balloon excursions, day trips to the Indian ruins and more. If you need a spa treatment or tee time we will look after it. We want you to get the most out of your Sedona Mountain Christmas, and will help our guests in any way we can. As a pet-friendly hotel, there is no charge for pets (up to room limit). Our guests enjoy access to a full gym and two swimming pools right next door at Los Abrigados – perfect for families! Call 1.800.313.0017 or book online.